Alfa Romeo contacted Giuseppe “Nuccio” Bertone of the Bertone design house and commissioned three concept vehicles to research the effects of drag on a vehicle. The idea was to create vehicles with the lowest possible drag coefficient. The cars were named BAT for “Berlinetta Aerodinamica Tecnica.” All the cars featured large rear bumpers and curved fins. They were built upon the Alfa Romeo 1900 chassis. Each of the three cars was presented at the Turin Auto Show, in 1953, 1954 and 1955 respectively. The lowest of the three cars’ drag coefficient was 0,19, an achievement even by today’s standards. For each of the cars, Alfa Romeo provided a five-speed gearbox and a powerful four-cylinder engine that produced more than 90 horsepower (67 kW), good enough to propel the car to a top speed of 125 mph (201 km/h). The 1956 Buick Centurion was an aerodynamic four-seat coupe with a patented rear-mounted television camera to provide a rear view to the driver. Front seats automatically slid back when the doors were opened for easier entry and also moved forward to provide entry and exit to the back seats. A cantilevered steering wheel positioned the steering shaft down the centre of the car, allowing more legroom for the driver. Designed by Marcello Gandini of Bertone, it was created to supply Ferruccio Lamborghini with a true four-seater car for his lineup which already included the 400GT 2+2 and the Miura. It was distinguished by amply glazed gull-wing doors and an equally amply louvered rear window. Propulsion was by a 2.0 L 175 bhp (130 kW) inline-six engine, actually a split-in-half version of Lamborghini’s 4.0 L V12, mated to a 5-speed transmission. 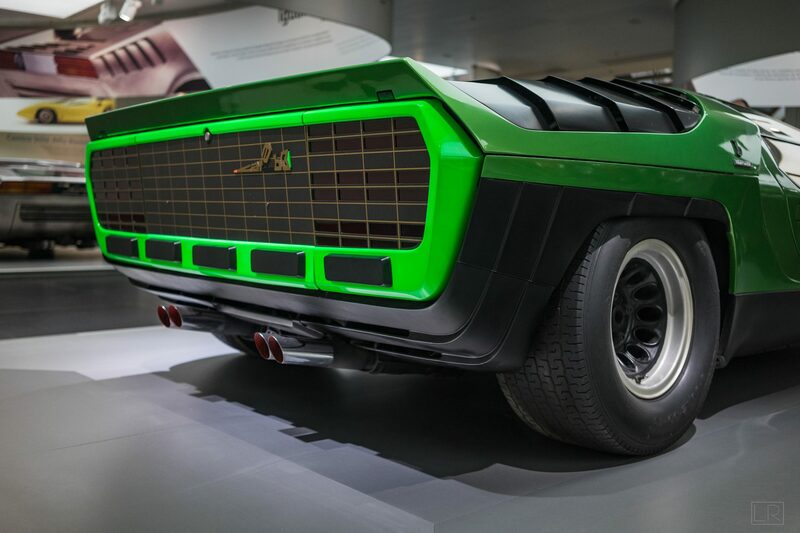 Alfa Romeo Carabo is a concept car first shown at the 1968 Paris Motor Show. It was designed by Marcello Gandini, working for the Bertone design studio. The Carabo name is derived from the Carabidae beetles, as evoked by the car’s iridescent green and orange coloring. The wedge design came into fashion in the late 1960s. The Carabo is often considered the winner of the ‘Wedge War’ award of 1968 and as the direct predecessor of the Lamborghini Countach and having heavily influenced many car designs to follow well into the next decade. It was never intended for production but was fully functional and showcased features never expressed in any other car design of its day, including its wedge design and scissor doors. The Ferrari 512S Modulo is a concept sports car designed by Paolo Martin of the Italian carozzeria Pininfarina, unveiled at the 1970 Geneva Motor Show. The Mercedes-Benz C111 was a series of experimental automobiles produced by Mercedes-Benz in the 1960s and 1970s. The company was experimenting with new engine technologies, including Wankel engines, diesel engines, and turbochargers, and used the basic C111 platform as a testbed. Other experimental features included multi-link rear suspension, gull-wing doors and a luxurious interior with leather trim and air conditioning. The Lancia Stratos Zero (or 0) preceded the Lancia Stratos HF prototype by 12 months and was first shown to the public at the Turin Motor Show in 1970. The futuristic bodywork was designed by Marcello Gandini, head designer at Bertone, and featured a 1.6 L Lancia Fulvia V4 engine. The Lancia Stratos HF Zero was exhibited in Bertone’s museum for many years. In 2011 it was sold during an auction in Italy for €761,600. It has been displayed in the exhibit “Sculpture in Motion: Masterpieces of Italian Design” at the Petersen Automotive Museum in Los Angeles. It was at the High Museum of Art in Atlanta at the “Dream Cars” exhibit in 2014, on loan from the XJ Wang Collection of New York City. 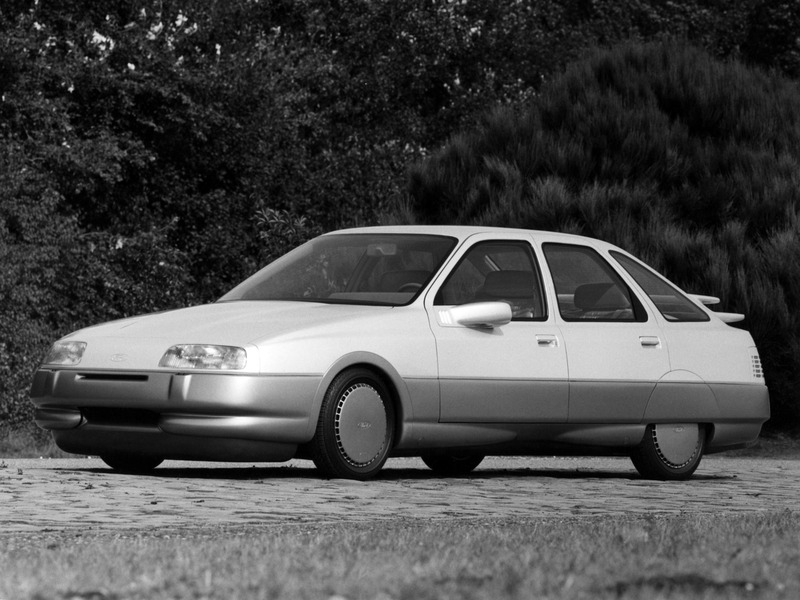 The design of the Boomerang would resonate through Giugiaro’s future designs for many years. Its sharp angles and wedge shape could be easily recognised in the 1973 Audi Asso di Picche concept, 1973 VW Passat Mk1, 1974 VW Golf Mk1, 1976 Lotus Esprit and Medici II show car, 1979 Lancia Delta and Maserati Quattroporte III, as well as the 1976 designed and 1981 launched DeLorean. Powered by a 4.7L V8 engine producing 310 hp (314 PS; 231 kW) and 460 N⋅m (339 lb⋅ft) driving the rear wheels, 5-speed manual transmission and having a fully decked out interior, it has a unique dashboard layout where the steering wheel and gauge cluster are part of a single console that emerges from the dash, and the steering wheel rotates around the stationary gauges. Starting in the late 1970s, Ford and Ghia started exploring a series of futuristic designs with the “Probe” series of concept vehicles. The Probe I, first shown in 1979, was a wedge-shaped design that incorporated a number of drag-reducing features like covered rear wheels and pop-up headlights. This was followed the next year by a much more conventional looking Probe II, whose hatchback styling was also reminiscent of the pony cars. The 1981 Probe III was an advanced demonstrator with covered wheels, but its bodywork evolved into the more conventional Ford Sierra (or Merkur XR4Ti) and styling notes that were used on the Ford Taurus. The 1982 Probe IV was a more radical concept car with a low Cd (drag coefficient), and evolved into the equally radical 1984 Probe V.
The Dodge M4S is an American high performance prototype sports coupe originally engineered, designed, and built by Dodge in 1981 as a technology demonstrator vehicle. 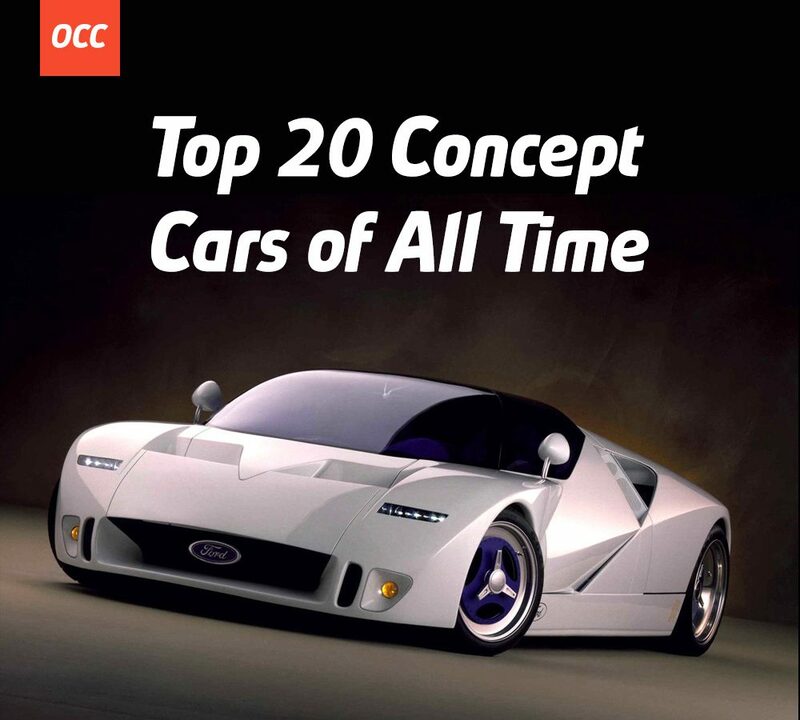 It was designed by then chief designer of Dodge, Bob Ackerman. The designation M4S denotes “Midengine, 4 cylinder, Sport“. From its conception, the car was intended to be built as a fully engineered running prototype rather than as a display piece. Because it was intended to be used as a pace car, it was designed to reach a top speed of 200 mph (322 km/h). The car had a carbon fibre body construction also using the material for the construction of the space frame. Due to this, the car weighed a total of 1,100 kg (2,425 lb). The engine cover and front of the car were made from a single piece of molded carbon fibre. The car had a glass engine cover which displayed the 5.0-litre V12 engine shared with the BMW 850i. The engine generated a power output of 300 hp (224 kW; 304 PS). The car had a unique door mechanism which had conventional doors and windows opening in a gull-wing arrangement. A year later in 1992, the Nazca C2 was introduced. The C2 had a redesigned front (the headlamps were relocated beside of the kidney grille) and a modified engine. Italdesign had engaged the German automobile manufacturer Alpina into the project. Alpina modified the engine and as a result, the engine gained an additional 50 hp (51 PS; 37 kW). This engine was shared with the Alpina B12 5.7. Additionally, the C2 also had fixed racing seats and three spoilers at the rear to signify its race inspired status. The C2 also weighed a claimed 100 kg (220 lb) less than the preceding M12. The Audi Quattro Spyder concept was presented at the Frankfurt Auto Show in 1991. The Quattro Spyder was an aluminium bodied mid-engine sports car. It would not be until 2008 that Audi would produce a similar car in production form – this being the superb Audi R8. Powering the Audi Quattro Spyder was a 2.8 litre V6 developing 174 horsepower and 181 ft/lbs of torque. The 5-speed manual gearbox sent the power to all four wheels – obvious considering the ‘Quattro’ name. The mid-engined GT90 is a spiritual successor to the Ford GT40, taking from it some styling cues, such as doors that cut into the roofline, but little else. In regard to angles and glass, the Ford GT90 was the first Ford to display the company’s “New Edge” design philosophy. The GT90 was built around a honeycomb-section aluminum monocoque and its body panels were molded from carbon fiber. The GT90’s 48-valve V12 is constructed on an aluminium block and head, displaces 6.0-litres (5,927 cc), and produces an estimated 720 hp (537 kW; 730 PS) and 660 lb⋅ft (895 N⋅m) of torque. The Chrysler Atlantic was a retro concept car created by Chrysler. It was first shown in 1995. The Atlantic was designed by Bob Hubbach and inspired by the Bugatti Atlantique. The idea for this car began out as a sketch on a napkin by Chrysler’s president Bob Lutz in early 1993 and also involved the automaker’s chief designer, Tom Gale. The Lamborghini Calà (also known as the Italdesign Calà) was a concept car designed for Lamborghini by Italdesign Giugiaro. It was first shown at the 1995 Geneva Motor Show. It was a completely functional prototype that never made it into production. Its name was derived from the Piedmontese dialect of Northern Italy and meant “look, over there!”. The Calà was envisioned by Italdesign to fill Lamborghini’s need for a replacement for the Jalpa, which discontinued production in 1988 at the behest of then owners of the company, Chrysler. When Chrysler sold Lamborghini to Megatech in 1994, the Calà’s design took shape, but when Megatech sold Lamborghini to the Volkswagen Group in 1998, the concept was shelved. The Jalpa would finally be replaced in 2003 by the Gallardo which used the principles of the Calà as an inspiration. The Alfa Romeo Scighera is a functional, futuristically styled concept car designed by Fabrizio Giugiaro and constructed by Italdesign of Turin, Italy in 1997. The name “Scighera” means mist in Milanese dialect. The Scighera is based on the 164, and has an all aluminium body, the frame structure is made of aluminium-carbon fibre composite, and powered by an Alfa Romeo 3.0 L (180 cu in) twin-turbocharged V6 engine. The engine produced a maximum power output of 400 hp (298 kW; 406 PS) at 7,500 rpm and 327 lb⋅ft (443 N⋅m) of torque. The all wheel drive system was derived from the 155. The interior of the car had Connolly leather upholstery. At the request of then Volkswagen Group CEO Ferdinand Piech, Giorgetto Giugiaro and his Italdesign team was tasked to design a Volkswagen sports car, with instructions that it had to accommodate a 12-cylinder engine in a W configuration, be mid-engined, and also be able to be configured with Volkswagen’s Syncro four-wheel drive system. In 1997, at the Tokyo Motor Show, Volkswagen debuted their first sports car concept, a bright yellow W12 Syncro (also known as the W12 Syncro Coupé) with a 5.6-litre W12 engine producing 309 kW (420 PS; 414 bhp) with Syncro four-wheel drive. This, and the W12 concepts after it, were all designed by the Italdesign firm in Italy. 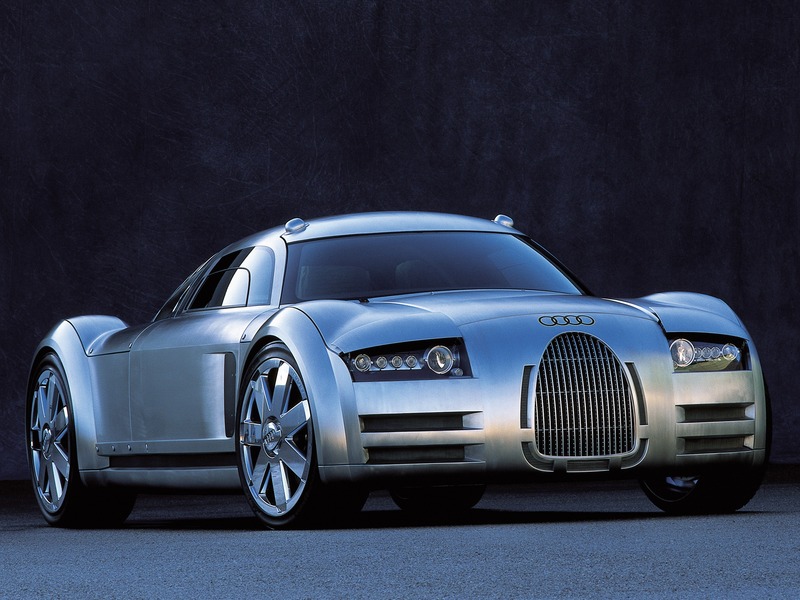 The Audi Rosemeyer is a concept car built by Audi, shown initially at Autostadt and at various auto shows throughout Europe during 2000. Although it was never intended for production, its striking design and highly sporting nature drew considerable attention to the brand, and many potential buyers highly anticipated a production version, to no avail. The vehicle was designed to evoke emotion and garner attention, and was unique in that it combined elements of modern design with styling strongly resembling the former Auto Unions “Silver Arrows” Grand Prix racers, namely their 16-cylinder car driven by Bernd Rosemeyer, after which the car is named.